What is the install process for pole barns? If you are looking to have your tool shed or pole barn insulated, here is what you can expect from the estimate to the install when working with Indiana Spray Foam. A quote, can be requested online or by calling our office at 888-936-3626. At the estimate we will review your pole barn, provide a written estimate, and answer any questions you may have. If the pole barn is not yet built, you can use the budgeting calculator to get rough budgeting numbers for your project or submit the prints to us for a more precise estimate. We would still need to walk through and review the structure once built to confirm the estimate. 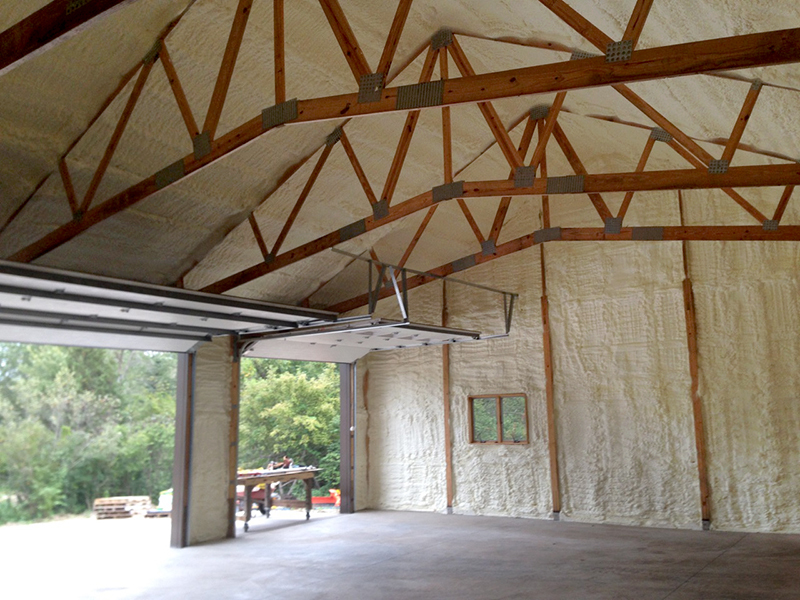 Depending on the scope of work and discussions from the estimate, we will use open or closed cell spray foam on the walls and roof deck of your pole barn. The majority of customers have both the walls and roof done at the same time to totally seal up the pole barn, while others may start with one area and have the second phase done the following year. After insulating your pole barn, the foreman will review the job with you and get your sign off. After processing your paperwork, we will send you a lifetime warranty in the mail that covers the product and our workmanship.